You can’t blame Joe Torre if he lapsed into a bout of déjà vu while watching Mariano Rivera mow down the Dodgers while protecting a narrow lead in the ninth. When James Loney took a called third strike to end the game, however, the spell was finally broken as the Dodgers’ bench, led by Torre and Don Mattingly, erupted in protest. Mattingly repeatedly shouted that the final strike call was a joke (alongside a few choice explicative), but it was no laughing matter for the Dodgers, who have now lost seven of their last eight games. 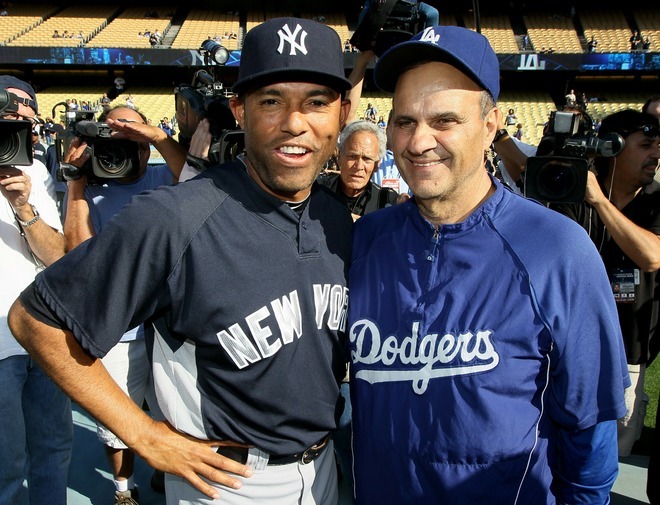 Joe Torre was all smiles at the sight of Mariano Rivera before the first game between the Dodgers and Yankees. His demeanor was much more dour after watching Rivera strike out the side to earn the save against his Dodgers (Photo: AP). What looked like a mismatch on paper quickly evolved into a pitchers’ duel between CC Sabathia and Vicente Padilla. The Dodgers got on the board first after Furcal led off the first with a walk, stole second and eventually scored on a two out hit by Manny Ramirez. From that point on, however, the Dodgers would only advance one more runner as far as second base. After starting the game with an explosive, albeit sometimes erratic fastball, Sabathia was able to shift gears in the second half of the game by featuring his change-up and curveball, the latter which he was able to throw for a strike over 80% of the time. In his eighth and final inning, Sabathia appeared to tire a little, but used his entire arsenal to retire the side in order despite running a full count on every batter. By following up on his eight shutout innings against the Mets with another strong outing, Sabathia seems to be on track to be the ace level pitcher the Yankees relied upon so heavily last season. The reason Sabathia had to work so hard in tonight’s game was because Padilla manufactured an almost equally strong outing by throwing everything but a knuckleball at the Yankees. By featuring a curve as slow as 55 and a fastball topping out around 95, Padilla was able to keep the Yankees off balance for most of the night. Alex Rodriguez didn’t seem to be fooled, however. In the top of the second, Arod led off the inning with a double on a first pitch fastball and eventually scored the tying run on Jorge Posada’s RBI single. Then, leading off the sixth, Arod drove another first pitch fastball deep into the left field seats to give the Yankees a 2-1 lead. Before the series, Torre stated that he didn’t hold any hard feelings toward Arod, but after tonight’s game, he might be singing a different tune. In addition to throwing against Padilla, Sabathia also took the opportunity to throw at him. After Robinson Cano was plunked in the top of the fourth, Sabathia responded by drilling Padilla in the leg during his next at bat in the fifth. Although the pitch seemed to be in retaliation for the pitch that hit Cano, it could also have easily been a long overdue response for Mark Teixeira being drilled twice by Padilla in his last game against the Yankees while he was with Texas during June of last season. After hitting Padilla, Sabathia took a very aggressive posture, but no further incident ensued. It remains to be seen whether the Dodgers were content to see Padilla take his medicine, or if a response will be forthcoming in game two. Before the game, the storyline centered on Joe Torre facing off against his old team, but by the ninth inning, a classic battle of future Hall of Famers took center stage. As he has done so many times in the past, Mariano Rivera squared off against Manny Ramirez and once again got the best of the long running confrontation. After striking out Ramirez, Rivera then did the same to Kemp and Loney to close out the game. In a somewhat eerie scene, Torre and Mattingly were not celebrating Mo’s save, as they had done so many times in the past, but were instead angrily disputing the result. Although the protestations from the Dodgers were strong (and carried over to the post game), PitchFX data suggested that each pitch to Loney was in fact a strike. Perhaps he was simply trying to shield his player from any action that might warrant a suspension, but Mattingly’s uncharacteristic display of invective was still a disconcerting sight to see. Judging by the Dodgers’ reaction at the end of the game, it seems as if the team has placed a little extra emphasis on this series. From the Yankees standpoint, however, building a lead in the AL East remains all the motivation that the team needs. Despite not being able to put together a truly dominant game in some time, the Yankees keep managing to do just enough to win games, even though their rare losses to some less than marquee pitchers have almost made it seem as if they have been struggling. Tonight’s game against Padilla looked as if it was headed down that same path, but Sabathia, Arod and Mariano combined to alter the course. The Yankees are now 2-2 against the Dodgers in the regular season, leaving the Cincinnati Reds (2-4) as the only team against which they do not have at least a .500 record. Manny Ramirez now has 164 RBIs against the Yankees, his highest total against any team. With is ninth inning strike out, Ramirez is 8 for 39 in 44 plate appearances against Mariano Rivera. Rivera has both faced (44 Pas) and struck out (13) Ramirez more than any other opponent.